Photo View Postcard. Multi. Cardstock. 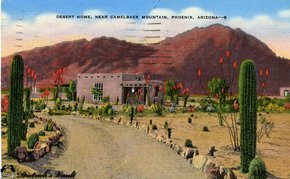 This linen textured, color tinted card is titled, "Desert Home, Near Camelback Mountain, Phoeniz, Arizona--5." Harry E. Strong, Phoeniz, Arizona. From Pfc. Thomas OMann, 355th Engrs. Military postmarked 1946.